Jeremy was born in Brooks, Alberta in 1978. After moving to Mackenzie, BC in 1993, he was introduced to snowboarding. It was not long until he was spending all of his extra time riding at Powder King Resort. In 1996 he moved back to Southern Alberta to work in the oil and gas industry, but still spent all of his free time in the mountains of British Columbia snowboarding. Fernie Alpine Resort, Sunshine, and Lake Louise became his playground for the next 5 years. Following his love for back country snowboarding he purchased a snowmobile in 2000 and started riding in Golden, BC. It was only a year later that he discovered Revelstoke, BC. Falling in love with the community he purchased a house. He traveled back and forth for a while, but when things in the oil and gas sector slowed down in 2009 Jeremy left to start a new career in the avalanche industry. In 2004, Jeremy was buried in a class 3 avalanche. He did not realize the event was going to play such a huge role in his future. Coming so close to losing his life affected him, and made him want to educate others on how to be safe in the back country. Between 2000 and 2009 he rode snowmobiles, and worked with different winter action sports film companies, gaining experience in a new industry. After being asked to do a presentation for the Canadian Avalanche Association in 2008, he realized he had found a new calling. Spending the last few years developing his company Soul Rides, an avalanche education and consulting business, he spends most of his time teaching people about safety in the back country. Jeremy is now working on other businesses and projects in the Revelstoke area. Still snowboarding and snowmobiling in the winter months, he doesn’t see himself leaving the area anytime soon. 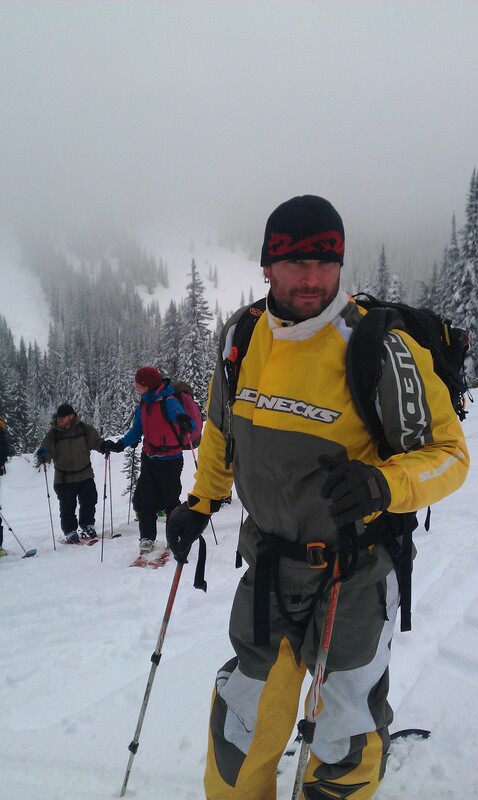 After finishing an avalanche operations level 1 course in 2010 Jeremy realized there was a need for further research. “We had just finished our operations level one course and saw a few holes in the course work about how sleds affect the snow pack, so we put our money where our mouths were and did some work.” Jeremy and Jeff Scott spent 30 or more days digging huge snow pits to test their snowmobiles in the snow pack. They did their best to document all their work with video and photos as well as the results. Spending their own money, and with no financial gain, Jeremy and Jeff's work was driven by their desire to ensure all back country riders become fully educated and prepared for dangerous conditions. Jeremy's hope is that the CAA and professional back country riders can work together to ensure the safety of everyone in the mountains. Jeremy had a great time filming with Brain Farm Cinemas for the Art of Flight. “Hands down the most professional fun crew I have ever been with in the mountains.” Working with Brain Farm for most of the 2011 winter, he considers it one of the greatest projects he has ever been a part of. Referring to the crazy log ride he did when filming for Art of Flight, he admits he ‘‘should have never got off on the second try, I had that." And that's Jeremy. Always passionate about what he does, and always driven to do better. Jeremy plans on living in Revelstoke long term. He has a large timber frame home hiding outside of Revelstoke that he is able to snowmobile from door front. He is planning on turning it into a private lodge for snowmobilers. With a large full functional shop and sled storage, “you can just load up the 600 liter fuel, can load the place up with food and never see a track. I love the place.” Seeing the photos it’s hard to argue his point. If that wasn't enough work he has another venture on the go. He refers to it as a mini kitty, which can take small groups cat skiing and snowboarding or provide a shuttling service for ski touring and split boarding. He also plans on shuttling mountain bikers with it for the summer months. “Revelstoke is an amazing place to live and there is not a day goes by that I don’t appreciate living in such a great place.” Hoping to create positive and successful business ventures appear to be Jeremy’s main goal. Spending a few hours with Jeremy was one of the most entertaining things I have done in a long time. I hope one day you can all meet this big hearted man.